Botswana is to set up solar energy plants to cut down on emissions from the current coal-fired power station. The 100MW Solar Power Plant will augment Botswana’s power supply and reduce the country’s carbon footprint and help conserve the environment. Botswana has one of the highest solar energy ratings globally, the mostly sunny days gives the country the potential to greener energy. The sun is free, in abundance and inexhaustible. Solar technology converts the sun’s radiation directly into electricity with no pollution or damage to the environment. The panels can generate enough power to run stoves, pump water, light clinics and power televisions. Botswana is a semi arid country with mostly sunny days, one of the best climates for this type of energy. 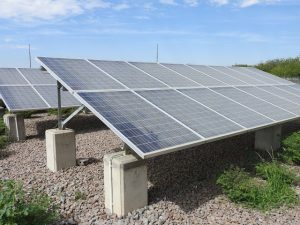 The investment in the 100MW Solar Power Plant sets the stage for more fully exploiting this natural resource that the country has in abundance and begins to deliver on the nation’s Vision 2036 commitment and Botswana’s national commitment under the Paris Climate Agreement for a significant percentage of our energy to be sourced from renewable green sources. This development is part of fulfilling expectations of the Paris Agreement, which Botswana signed to increase green energy mix by 25percent within the next seven years. Consequently Government has implored its first steps into a greener environment through the employment of solar power plant projects in rural areas. Tobela village is currently benefiting from green energy during the day and powered by Botswana Power Corporation (BPC) through night. Botswana is currently getting her power from the coal-fired Morupule Power Station located in central Botswana. Twenty remote located villages are to benefit from solar energy plants, with Seronga village, near the Zambia border being the first village to be electrified with green energy. The solar power plants follow a 1.3MW power station in Phakalane in Gaborone. The BPC chief executive officer says the development has motivated the enhancement of specific sectors to include agriculture, mining, agronomy, energy, waste management through the economic diversification drive (EDD). Botswana needs to establish 250 megawatts from solar capacities within the next 10 years. The use of cheaper and more sustainable solar power will activate progress in these different sectors and in turn be beneficial to the country at large. Earlier in year 2018 the ministry of mineral resources, green technology and energy security said about 145,000 out of the 242,000 households can be reached by the end of 2021 if the off-grid solar was implemented in 2018. This equates to 60% of total off -grid market or an installed capacity of approximately 30MW. Solar power is booming in popularity all around the world, across all sectors, from household to utility scale, and both on and off the grid. Historically solar energy has been prohibitively expensive to produce on an industrial scale. However, for the past 10 years, prices of the major component in solar plants, being the solar panels, have consistently fallen, some experts say by as much as 80%. This has resulted in this energy source becoming more affordable. However efforts to solicit information if Botswana will in future use wind powered turbines as power sources were fruitless. Botswana also has potential for wind powered energy sources as the country has much land to establish wind green energy turbines.